Don’t tell my boss, but I’m pretty sure I’m only working a half day today. I’ve got something way more important to write about than free pizza. That’s because an amazing contest is going on right now, and one lucky winner will get to stay on Australia’s Great Barrier Reef for a night — totally free. And I do mean on the reef: If you win the trip, your accommodation will actually float. 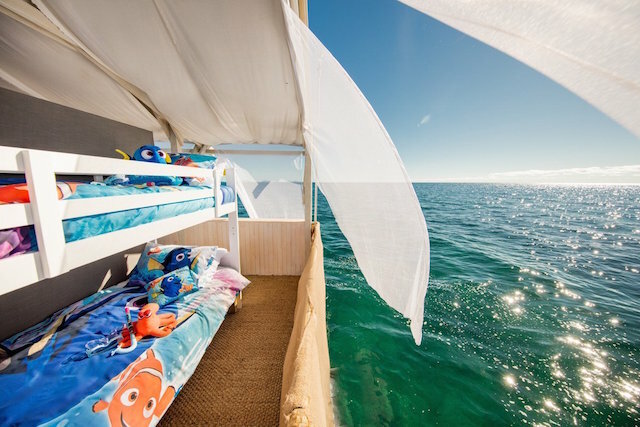 Airbnb is offering this once-in-a-lifetime trip to a lucky family of four, just in time for the release of Pixar’s much-anticipated “Finding Dory,” which takes place on the Great Barrier Reef. If you win, you’ll be sleeping right above Dory herself in a beautiful floating apartment for one unforgettable night (July 13). You’ll also get to scuba dive the famous reef with a marine biologist and your host, Pascal, as well as nosh on a private beach lunch, featuring local ingredients cooked by celebrity chef Neil Perry. Even better? All your transportation is free: You’ll fly into and out of Cairns, Australia, where you’ll stay in another Airbnb accommodation on the evenings of July 12 and 14. The prize is valued at about $30,000 — to say nothing of the value of the experience. The Great Barrier Reef is home to a baffling number of species of fish, whales, sharks, coral and molluscs, and considered one of the seven natural wonders of the world! Oh, and “no clownfish jokes.” Obviously. Already reaching for your suitcase and swim goggles? Here’s the fun part: It’s an essay contest. And it’s incredibly simple to enter. Seems like it’d be hard not to write about, am I right? Talk about daydreaming. Spirit of the submission. How does your submission answer the question about why you and 3 guests belong on the Great Barrier Reef? Plus, you only have 500 characters to make your case — or 300 if you’re writing in Chinese, Japanese or Korean. And despite our high school complaints about word counts, brevity is way harder than it seems. So, yeah, that’s probably what I’m working on today. Sorry, team! A panel of judges will choose the winner on July 4, who will be notified via phone and email within 24 hours. If you’re chosen, be sure to pick up the phone: Winners forfeit the prize if they don’t respond within 24 hours of notification. You also need to be 21 years old to enter. Keep in mind the prize doesn’t include visa fees, meals (other than the one included in the prize) or any other expenses. Check out the listing for the full rules — and, of course, to submit your essay. Or just to drool over the pictures of the apartment. Your Turn: Will you enter to win this insane Airbnb trip?